It’s home race week for Flying Lizard Motorsports as the GT4 America Championship prepares for round three of the Sprint championship at the Long Beach Grand Prix. The California-based team will return to the temporary street circuit and three day festival of speed with Michael Dinan and the No. 21 Porsche 718 Cayman GT4 Clubsport. The GT4 Clubsport will debut its 2019 livery at Long Beach, having been delivered to the team just days before the back to back events of Circuit of the Americas and the Grand Prix of St. Petersburg last month. The car will feature a dark blue fade on the lower half of the silver body, with the iconic Flying Lizard shield on the front of the car in light blue. Fans will be able to see the car up close beginning with Thunder Thursday at Pike Outlets in downtown Long Beach, Thursday, April 11 from 6:00PM to 10:00PM. This free event kicks off the Long Beach Grand Prix every year, with live music, GT4 America cars on display, motocross demonstrations, and an autograph session with the drivers in the series. Flying Lizard Motorsports has raced at the Grand Prix of Long Beach seven times, winning in 2009 and 2010, as well as clinching seven podiums. 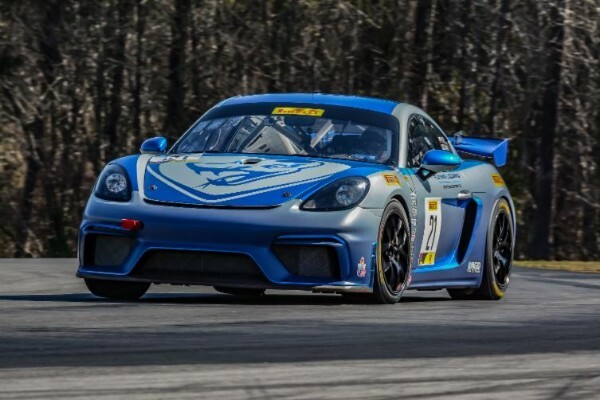 Round three of the GT4 America Sprint championship will depart from the standard double header weekend and feature one 50 minute race, to be held on Sunday, April 14 at 10:00AM Pacific. Due to the amount of series on track, including the IndyCar Series and IMSA WeatherTech SportsCar Championship, track time for all competitors will be fairly limited. GT4 America competitors will receive 75 minutes of track time before qualifying on Saturday morning. Michael Dinan, who made his street racing debut last month in rounds one and two of the Sprint championship at the Grand Prix will be the sole driver of the No. 21 Porsche. His SprintX co-driver Robby Foley will be on hand as the coach for the event. The pair will race together again later this month at the Virginia International Raceway SprintX double header. The Long Beach Grand Prix celebrates its 45th running this season, currently the longest running major street race in North America. Attracting over 200,000 people each year, the downtown streets of the city are shutdown to host a three day festival of speed, live music, and food. The 1.968 temporary street circuit runs along the water, around the Long Beach convention center, and through the heart of downtown, setting the scene for a picturesque backdrop to the racing action. Long Beach is a funny place. It’s a generality that with most street courses where you qualify is extremely important because this race can become a parade very quickly. It’s very difficult to pass here, and based on the varying speeds of the competitors, it can be a big move of chance as well. The setup of the car is important, but not as important as qualifying well. You need to set yourself up in a position where you can stay ahead of the mess and defend your position, while also having the speed and skill to get by the back markers. If you don’t qualify well, you’ll defend the entire race. Long Beach isn’t a circuit with a lot of grip, and the track is a moving target because of varying temperatures, as well as the varying types of rubber that will be set down over the course of the weekend. There are several circuits out there, many using a different tire manufacturer. When a tire degrades and starts to pick up the rubber put down on track by other competitors, and that alters your own tire’s grip at mid-life. For this race, setting your tire temperatures and pressers is critical to working with these varying factors.